Our company has a Free Reverse Cell Phone Lookup tool that can help you find friends and family on the web absolutely free. Technology now connects people in a way that it never has before. The 21st century has brought a wave of technological advancements, and the most popular so far is the cell phone. We’ve all had to look up a cell phone number at one point or another. With the rising number of people owning only cell phones, it’s becoming harder and harder to find out who the owner of a phone number is. While searching a cell phone number on Google sometimes works, it’s not the best option. (See the infographic below.) 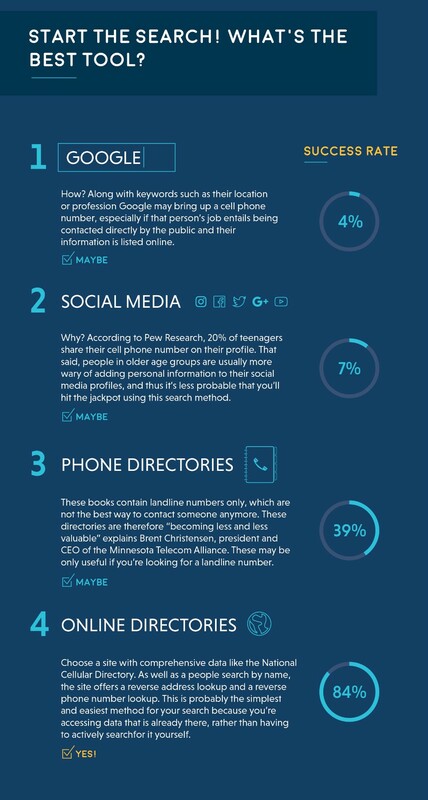 Most of the time, online directories best way to perform a cell phone lookup. Their success rate in finding cell phone numbers is much higher, but unfortunately, most of them charge an arm and a leg and have hidden fees. This is where our amazing company steps in. We recognize that not everyone can afford to pay to look up a number. National Cellular Directory provides our reverse cell phone lookup tool (which is typing in a cell phone number and getting a name) for absolutely free. Now that I’ve given you the background on our easy to use free reverse mobile phone lookup service here is how you would perform one to find the available information. 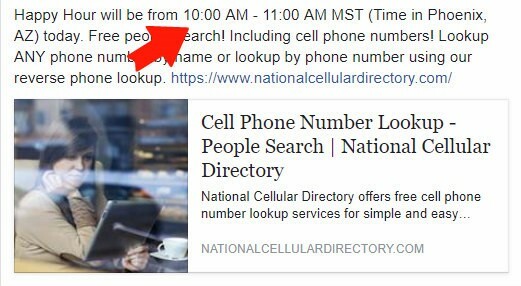 To start, it’s important to note that National Cellular Directory’s one hundred percent free people searches happen one hour a day during our Happy Hour. To see when happy hour will be every day (it is at different times every day) there are two simple methods. Our first method to find out whether or not it is Happy Hour is to follow National Cell Directory on Facebook or Twitter. Every morning we will post when happy hour is, and then all you have to do is log in at that time and click the run free searches now text. There are two ways in which to follow us on Twitter or Facebook. If you go to our Happy Hour page and scroll to the bottom, you can sign up for alerts by clicking the like button for Facebook or the follow button for Twitter. As you can see our Happy Hour post will be posted every day, and we schedule based on the time in Phoenix, Arizona. If you don’t reside in that time zone, you can search for current local time in Phoenix, Arizona on Google and then compare it to your time zone to calculate when Happy Hour will be in your area. There is also a second method to see whether or not it is Happy Hour, but it is a little more work and can involve going to our website several times a day. For this method, you want to go to our website by typing www.nationalcellulardirectory.com into your navigation bar. After you are on our website, go to the right and click Login. There is a sign up free button on the front right side if you do not have an account with us. (You need to create an account to access Happy Hour if you have any questions about creating an account we would love for you to contact us. Note: When creating an account, you will be required to enter a credit card but YOU WILL NOT BE CHARGED just by creating an account. The only time that you are charged are when you make a purchase. The great part about having an account with National Cellular Directory is that along with our free Happy Hour tool, and we also provide all of our account holders access to their search history at any time for free. This means that an account holder can view search history results whenever they please. Now after you create an account and log in, on the top of the screen, you can see whether or not it is Happy Hour. If it is Happy Hour, click the run free searches now text. This is the second method on how to find out if it is Happy Hour. Start by selecting the Reverse Cell Phone Lookup option. Then you want to perform the search by simply entering the number and hitting the search button. After that, our website will run the comprehensive search. Unlike some of our competitor’s websites, the search should take less than thirty seconds to complete. And then our customers can use one of their Happy Hour search credits to add to their cart and process their report. It’s as simple as that. If you have any other questions on how to perform a free Happy Hour search you can email us. You can also watch our step-by-step Happy Hour tutorial youtube video How To Perform A 100% Completely Free People Search.